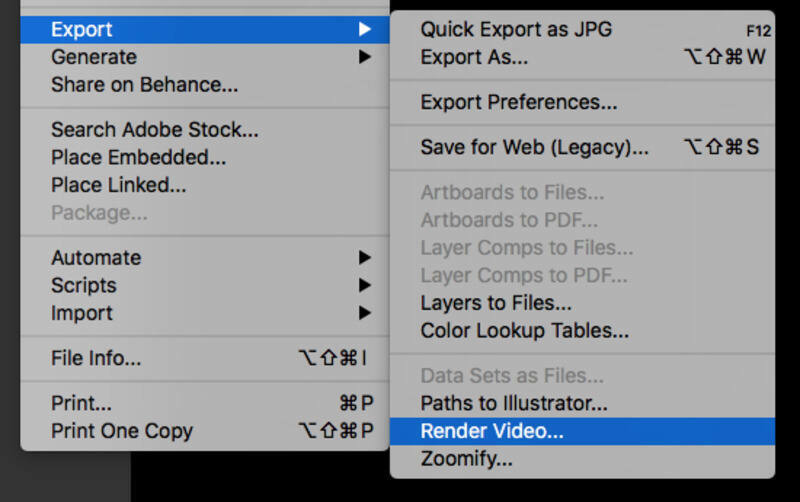 Convert any video to JPG, including AVI to JPG. When it comes to digital images, JPG is the most commonly used format. Owing to its compressed nature, it occupies less storage space. A number of JPG images can be converted into a slideshow or an album by converting it to a video format like AVI. Since AVI is compatible with all types of players and devices, JPG to AVI conversion is a practical solution. Know about different types of JPG to AVI converter software in the following part. If you are in search for the best JPG to AVI converter, Wondershare Fotophire Slideshow Maker is recommended. 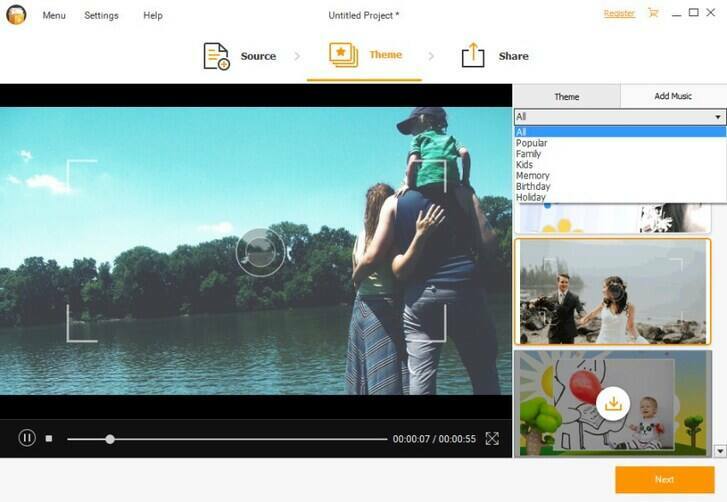 This expert program allows creating professional-looking photo slideshows from your pictures and videos. Compatible with Windows and Mac, the program allows editing your files, adding a theme to the slideshow, adding special effects, and music from your system or 75 built-in tracks. 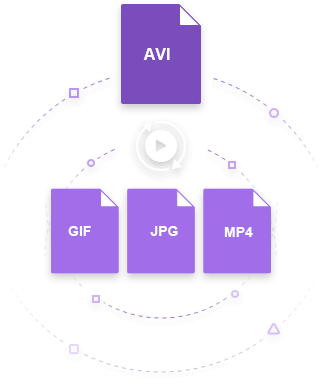 In addition to AVI, the JPG files can be converted to WMV, FLV, MOV, and others formats and also to pre-defined device specific formats. Allows adding multiple JPG files to convert to AVI format. Added files can be edited before conversion. 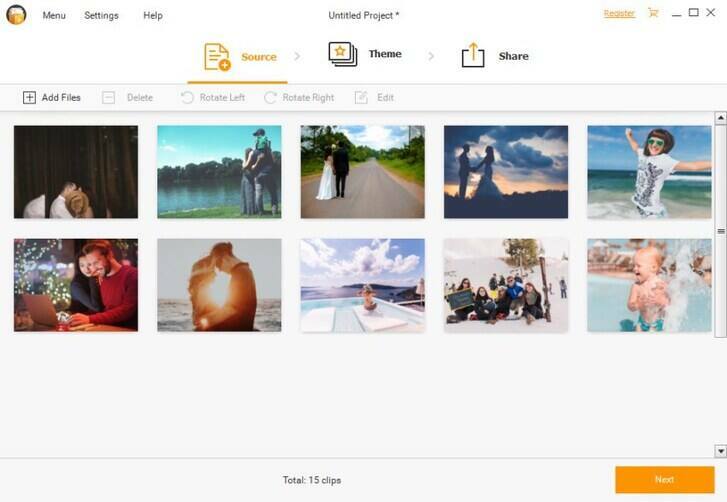 Allows selecting a theme for the slideshow. Created AVI slideshow can be shared on YouTube and Facebook directly. Step 1 Launch Wondershare JPG to AVI converter software and add photos. Download, and open Fotophire Slideshow Maker on your PC/Mac system. To add JPG files from your computer click Add Files button or the + Source button from the interface. You can also drag and drop the files. The added files can be deleted, rotated left or right and can also be edited as needed. Step 2 Choose a slideshow theme. Once JPG files are added and edited, move to the Theme tab from the main interface. Choose the desired template from the given options. Add music from built-in tracks or from your local computer as desired. Step 3 Convert and save slideshow to AVI format. Next, move to the Share tab. Choose the option of Local from the left side of the interface. Next, select AVI as the desired output format, give a name to the slideshow created, and choose the video resolution. At Save to: tab, choose a location on PC to save the converted file. Finally, click on Save button to start converting and saving JPG to AVI file. If you want to convert JPG to MP4, you can refer to the article of How to Convert JPG to MP4 >. For users on a budget, online converters prove to be the best choice as these programs are free to use and have a simple function. Online converters need no download or installation and can be used directly from your PC or Mac browser. Listed below are top JPG to AVI online tools. Basic converter with simple to use interface. 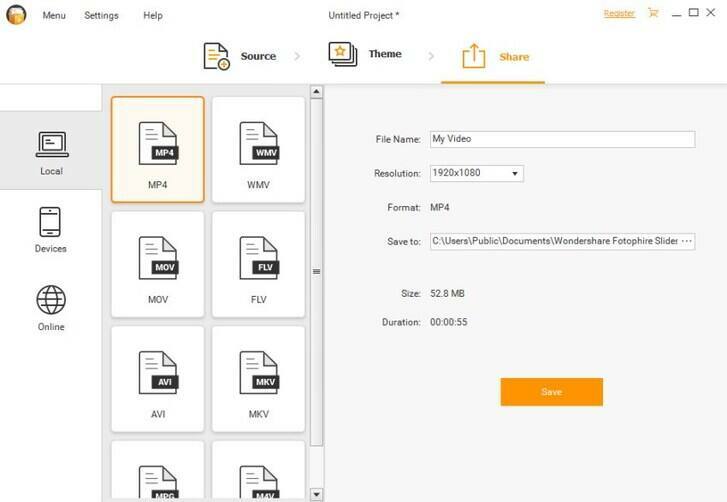 Supports an array of video and other file types for conversion. The converted file is sent to email id for download. 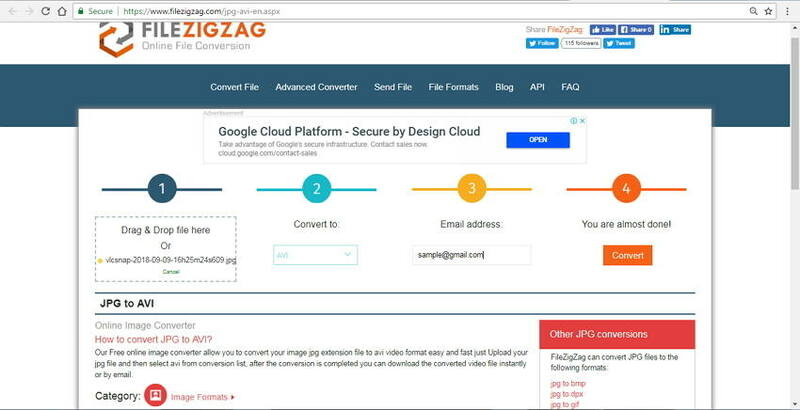 Step 1: Open https://www.filezigzag.com/jpg-AVI-en.aspx on your computer. Click Select to add JPG file from your computer. Step 2: At the Convert to: option, choose AVI from the video list. Step 3: Enter email ID where the converted file download link is to be sent. Step 4: Click the Convert button to start the process. Facilitates adding JPG files from computer, URL, Dropbox, and Google Drive. Allows to edit file parameters like frame rate, resolution, bit rate, quality, and others. Conversion settings can be saved for future conversions. 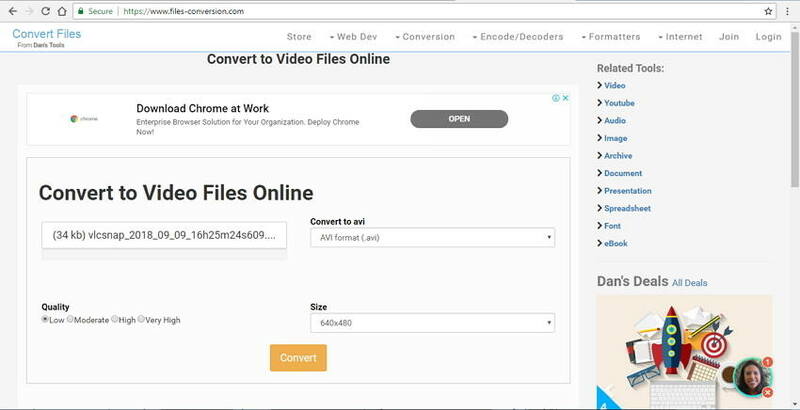 Step 1: Launch https://video.online-convert.com/convert-to-AVI on your browser. Click on the Choose file button to add JPG file. Step 2: Choose bit rate, frame rate, and other parameters under the Optional settings. Step 3: Click Convert file to start to convert JPG to AVI free. Video quality can be chosen from options- Low, Moderate, High, and Very High. Allows selecting file size in terms of resolution. The converted video can be downloaded from the interface. Step 1: Type https://www.files-conversion.com/ on your browser window. Click the Select a file button to add JPG files from your computer. Step 2: Choose AVI as the target format. Step 3: Choose video quality and size. Step 4: Hit the Convert button to start the conversion process. Photoshop by Adobe is excellent software for creating and editing pictures. The program is also used for high-end graphics designing and comes packed with an array of features and functions. Photoshop can be used to convert JPG to AVI as the software supports converting image sequences into a video file. Step 1: Open Photoshop software on your PC. 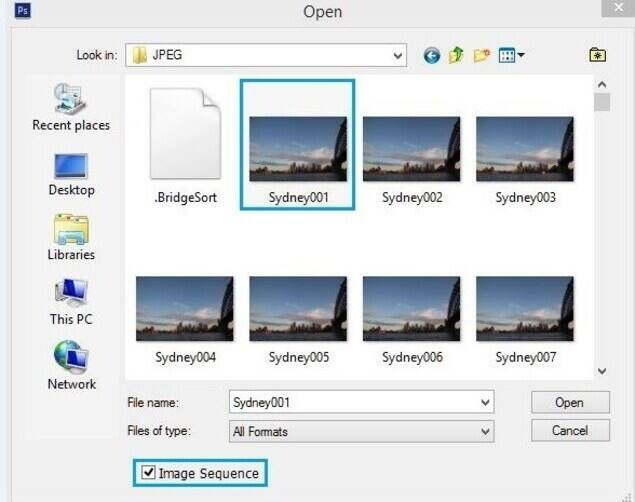 Next, open dialog box and select the first image and then check the option of Image Sequence under Open. Next, select the Frame Rate. Step 2: From the Timeline tab, edit the video as needed. You can also add special effects or change the video dimension if required. 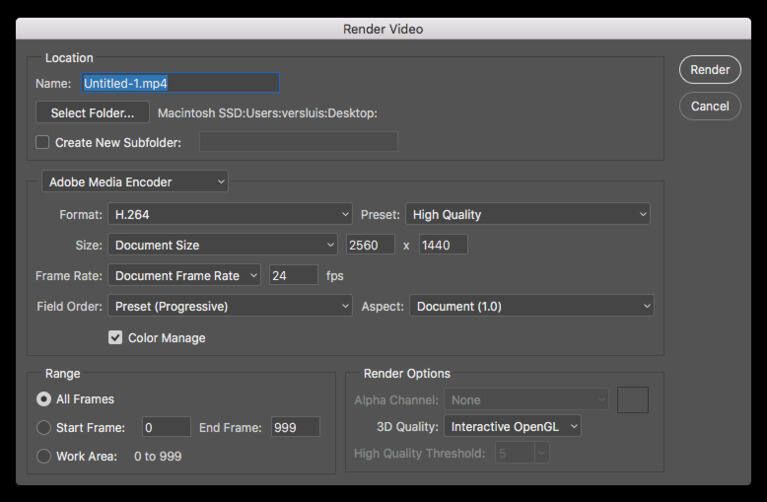 Step 3: Choose File > Export > Render Video and this will open a dialogue box of Render Video. From here choose the setting, codecs, AVI as format, and other parameters. Finally, click Render to start the process.